Unraveling the role of fusion in the universe has taken almost a century since Einstein's proof of the equivalence of energy and matter in 1905. The discovery that fusion reactions are responsible for the building of the light elements in the "Big Bang" and the subsequent development of the heavier elements in the stars and in exploding supernovae is one of the field's most exciting successes. 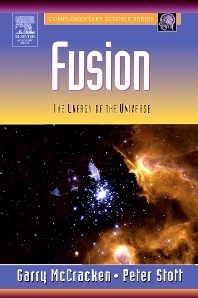 In this engaging book, McCracken and Stott reexamine these discoveries in astrophysics and discuss the possibility that fusion reactions are not only our sun's source of power, but may also be induced for our use on earth. Professionals and undergraduate students in Physics and Engineering, especially Nuclear Engineering. Also appropriate for general science enthusiasts. Garry McCracken gained a PhD in solid state physics but has spent most of his working life as an experimental physicist working on various aspects of the magnetic confinement fusion program with the UK Atomic Energy Authority at Culham Laboratory. His main interest has been in the study of the plasma boundary and in the interaction between the plasma and the surrounding structures and in studying the design of fusion reactors and the radiation damage problems which may be encountered. In 1979 he spent a year at the Plasma Physics Laboratory of Princeton University, USA, where he worked on the Princeton Large Tokamak. When the JET Joint Undertaking was set up as a European Fusion Laboratory to build the JET experiment he led a Task Agreement on the plasma boundary physics. His group built and installed major diagnostics on JET and an active experimental programme was pursued. In 1993 he went to the Massachusetts Institute of Technology, USA and worked on the C-Mod tokamak in the Plasma Fusion Center. Returning to the UK in 1996 to work again on JET, until his retirement in 1999. He has published over 300 scientific papers including three major reviews in the general area of plasma-surface interactions. He was a regular lecturer at the Culham Plasma Physics Summer School until 1991 and has been invited to lecture at a number of other Summer school courses in Canada and Europe. During these latter lectures he began to feel that there was no adequate book to explain the subject of nuclear fusion to the staring physicist and engineer or the interested layman and set about writing the present book. Peter Stott became interested in fusion energy whilst still an undergraduate student in 1962 and did his PhD in theoretical and experimental plasma physics working between Manchester University and the Harwell and Culham Laboratories. He joined the UK Atomic Energy Authority at Culham Laboratory in 1966 and has spent his professional career as an experimental physicist working on magnetic confinement fusion. After several years working on lower temperature plasma experiments, he moved into tokamak research in 1970. In 1973-5 he spent 18 months at the Plasma Physics Laboratory of Princeton University, USA working on the ATC tokamak. He has pursued a wide range of interests in the tokamak field including: the first applications of neutral beam injection heating, development of the control of impurities by gettering and by divertors, plasma boundary physics, plasma confinement and plasma diagnostics. In 1979 he joined the JET Joint Undertaking to take charge of the design and construction of the plasma diagnostics systems and from 1982 to 1999 he was Head of JET’s Experimental Division 1. From 1989 to 1999 he was coordinator for the European contribution to the design of diagnostics for the ITER project and was a member of the International Advisory Group. He left JET in 1999 to move to the Département des Recherches sur la Fusion Contrôlée, Cadarache, France. He has published over 200 scientific papers and has edited six books on plasma diagnostics and co-authored two on fusion energy. He has a keen interest in scientific publishing: being Honorary Editor of the journal Plasma Physics and Controlled Fusion from 1991 to 2000 and a member of its International Advisory Panel since 2000; a member of the Editorial Board of the journal Nuclear Fusion from 1987 to 1994; and Series Editor of the Institute of Physics Series of Books in Plasma Physics since 1995. He has been Director of the regular series of Courses and Workshops in Plasma Diagnostics.